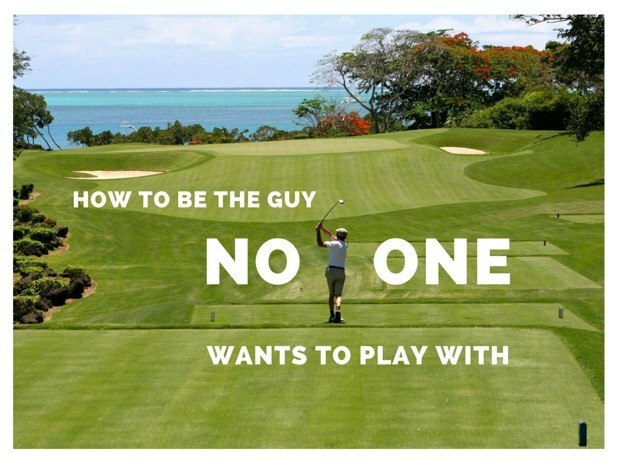 This is the guide to show you how to be the ultimate solo golfer - a Jack Reacher of sorts. Roaming from course to course looking for a game before just walking off into the sunset, onto the next course. Follow these principles and you too can be a lone wolf eternally looking for that elusive wolf-pack. It can be a very rewarding lifestyle: endless rounds as a solo flight, just you, the course and no one - not even a caddie. And when the weekend rolls around it's always refreshing to have a new four ball every week instead of a boring regular game with the same old guys you've known for the last 8 years. Golf also becomes a lot cheaper when there's no one to buy drinks for after the round. Keep reading to find out how you too can attain this life. Become the Jack Reacher of golf with these easy to develop habits! "I noticed you telling John to keep his spirits up after he missed that 3 footers. That's giving advice and therefore breaches Rule 8-1." is an example of something you could say to help the guys out in your group to better understand the rules. Penalize them the required number of shots and wait til the end of the round to tell them. This game is nothing without rules. The rules do get complicated so it's always great to have someone in the group who knows the whole book by heart to point out instances where the other guys unknowingly commit breaches. They'll value your input and remember your helpfulness for eternity. Caveat: knowing the rules and following them are two totally different concepts and just because you know them does not mean you need to actually play by them. It's always best to lie and pretend that you shot 75 in your previous round to cover up for the impending 100+ you're about to shoot. And make sure you tell everyone in the group more than once because people are skeptical and the more you repeat it, the more they'll believe you. Even if they played with you in the last round. Include lots of putter drops, hands-on-head freeze frames and an "I can't believe I hit that shot" or two to really drive home the point an convince them. Everyone loves free stuff especially pointers and tips on the golf course. But people are shy to ask for your expertise because of Rule 8-1 governing shot advice, so take the initiative and offer some tips to your partners when they duff a chip or yip a putt. It's just the right thing to do because we're all born PGA pros, we just didn't get the same opportunities as those guys. It's always polite to let the group in front finish putting in case you really catch one from 290. Most of the guys you'll play with are inconsiderate and will hit up to within 100 yards of the green! You don't want to take a risk in this situation - it's always better to wait even if your 3 wood tops out at 200 yards. It's pretty much a waste of time if you're not going to throw the club into the water or out of bounds. You never want to actually have to retrieve a club - once you throw it, it must stay gone. You do need to lead with the hips and come through with the arms later though to get enough distance to get the ball into the middle of the drink. Breaking clubs is not an option because once again you still have it in your possession and the shame of putting it back in your bag is unbearable. Unless you break them all, leave them right there and storm off the course. That's powerful. Rangefinders are awesome, there's no denying that but where the real benefit comes is inside 40 yards. There's nothing more valuable than knowing you have exactly 31.5 yards instead of guessing it's 32. Particularly useful is knowing how long a putt is so you can accurately recount the distances to your wife when you get home. You bought the rangefinder, use it. It doesn't matter if it's a one-footer for a 10 or you're lying 8 on the fringe, this game is not a joke. Any insinuation that you're holding up play should be ignored because you paid your green fee and you need to get full value. When you use this technique in conjunction with "don't play too quickly" and "be perpetually shocked at your bad play", you'll multiply your results. When you hole out and your marker asks how many, 5 is always a good number. You can use 6 if you think you took 10 or more shots. In general though 5 has a good ring to it. If anyone questions your score, look back at the tee box and slowly count each shot with a running commentary with the argumentative chap. When it appears your score is closer to 8 or 9, say "oh yeah I forgot about that" but never apologize. We're never sorry on the golf course. Sorry is for weaklings. Drive for show putt for dough: Use this after someone hits a long drive and makes a bogey after 3 putting. Another good one to use is "Nice drive, nice five". If you want low handicapper friends, they love this one. Never up, never in: This is one of those that is not obvious to everyone. Sometimes people don't understand if you don't hit the putt hard enough, it won't go in the hole. You lifted your head: The all-time classic. This one never gets old and despite the problem usually being a change in spine angle, no one has time for that long winded technical stuff. You lifted your head is so much simpler. When someone knocks the ball off the tee, always say "one". If you don't say it every time it happens, you will have bad luck for 17 years. When someone hits it fat, you're not Captain Obvious if you say "You hit the big ball before the small ball". It's always polite to let other golfers know exactly what went wrong in case they don't get it first time. You're standing to close to the ball after your follow through: really helps a golfer know they have more potential than they're displaying and is incredibly motivating. 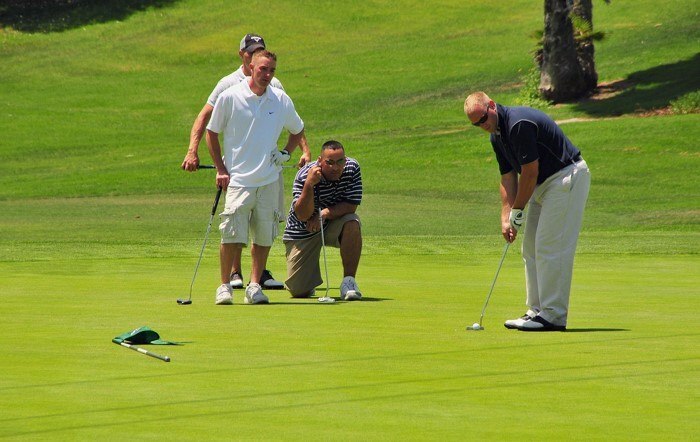 Whenever someone is still away/out on the putting green: "the 3 saddest words in golf... you're still away/out." If you want further reaching notoriety, this is a great technique to get a wider audience of golfers not to play with you so you can scale up your mission. We all have an inner-Miguel Angel Jimenez, so let him out to play. You never want to insult a golfer by searching for his ball in the long rough. Most guys overestimate how far they hit the ball and you don't want to be the guy who searches in the more realistic area of the rough for his ball. Imagine if you found it, how would that look? You'd firstly be showing he hits it like a girl and secondly, he would have to play from that awful lie. It's always better to stand in the fairway and politely shout-ask if they've found it yet. If not, play your shot to speed up play and wait for the rest of the group to catch up. No one wants to rush on a leisurely Saturday or Sunday. It's all about relaxing and since you've paid the same green fee as everyone else, it's always best to make it as relaxing and enjoyable for yourself as you can. With strict adherence to the rules you should always wait for the person furthest from the hole to play even if he can't find his ball. Rushing and playing ready golf is new-age nonsense and little do most people know, the saying is not "a good walk spoiled", but actually "a very long leisurely walk spoiled". That's your new motto. Most of the time the ball doesn't really need cleaning anyway so there is actually no point in marking it. Usually the coin glints in peoples eyes and when you use a copper coin, it gets lost on the green anyway. People complain if you use a tee peg and they don't like poker chips. It's not worth the effort of bending down and perhaps pulling a sciatic nerve. If anyone has anything rude to say, just putt your ball first, problem solved. 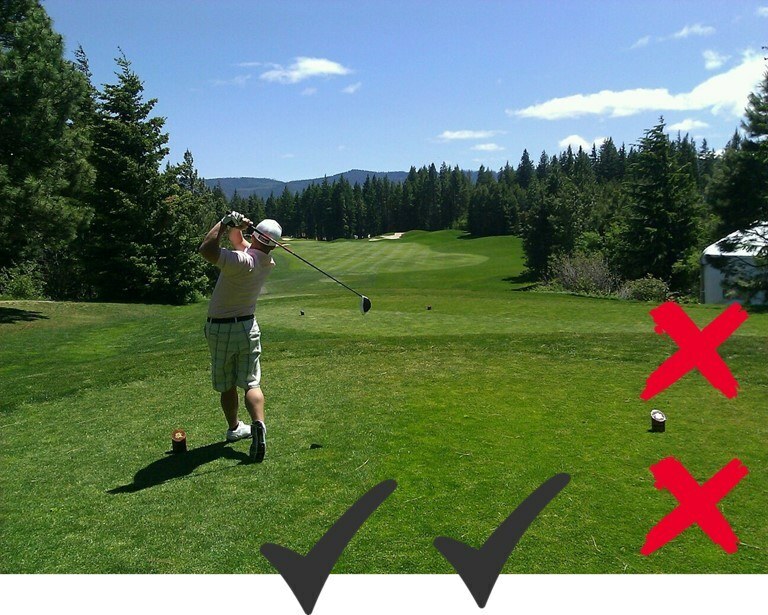 There is only one place to stand behind any golfer playing his shot - right behind the ball. Nowhere else. You're an important person and a busy person cannot go without their phone. In the updated Rules of Golf, they decided they need to move with the times and golfers with mobiles take preference over golfers hitting the ball. Who knows, you might be from MI6 or the CIA. In other words, you're more entitled to answer the call on someone's back swing than he is to be making the back swing. Offer mulligans every time it happens if they hit a bad shot. A common theme throughout this guide is the fact you've paid the same green fee as everyone else, you are allowed to do whatever you want - it's your party. 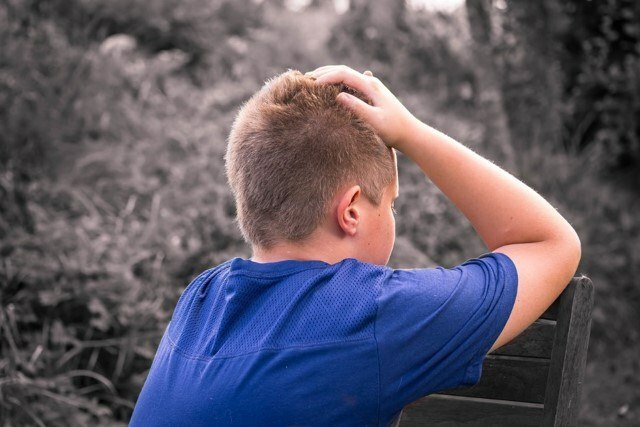 Whether you're having a bad day, hit a few in the water, took a 10 on a par 3 or just can't buy a putt, sulking is by far the most effective way to let others know how poorly you're playing. Most people are totally unaware of another players' performance so it's always a good reminder to walk far ahead of them and answer their chit chat with one or two word answers. Throwing in a down-turned mouth and making threats to never play golf again are cherries on the top. No one likes a guy who is happy when he's playing badly. It's just weird. Who doesn't like a free Pro V1 or Chrome Soft? Golf becomes an expensive game when you need to buy golf balls. The solution? Always carry a golf ball retriever and fish those balls out the pond. It's also a good idea to hit it into the woods every now and then and go find yourself some little treasures. Try to find two balls per hole and you'll never pay a cent for golf balls again. The quick-step just at the top of the guys swing is an excellent way to keep him alert and ready for anything. It takes some practice but if you get this right, you'll really have some great interactions on the golf course. Some weirdos might find it distracting for some reason but as mentioned already, we never apologize on the course. If anyone mentions your quick-step, you should do it on the next tee just to show you didn't mean anything by it. 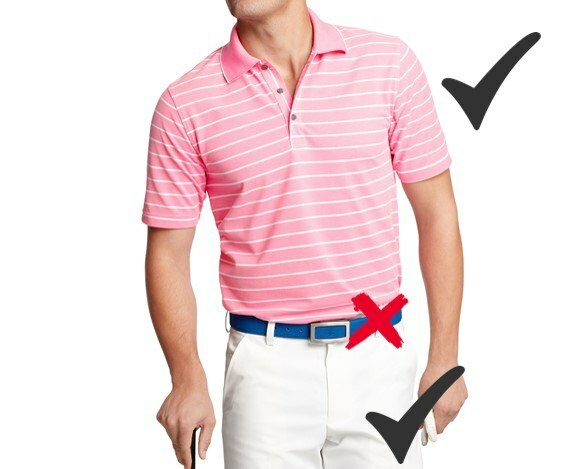 You should never wear any other color on your body at the golf course besides pink and white. I mean belts, shoes, socks, caps, gloves, pants, underpants, shirts, undershirts, sunglasses, everything. You can mix and match your clothes, but like the great car manufacturer, Harrison Ford said "It can be any color as long as it's pink and white"
If your quick-step is a bit delayed, taking your glove off on their back swing is generally the only time you should be taking off your glove. There's just no time in a 5 hour round to be taking it off after everyone has hit or between shots. That's ridiculous and if you've hit a bad shot, you're more entitled to rip the Velcro on someone else's swing. Modern golf shoes don't really do anything to the greens anymore so don't go to all that unnecessary effort of avoiding people's lines on the green. They'll probably miss anyway so whatever. It's highly unethical and immoral to bet on a golf game and if you find you're on the losing end, it's always best to drop the bag in the car, retrieve your bag from the locker and go home immediately. If you win, you should stick around for a drink after the game but once you have your winnings, you should leave ASAP in case they order another round and they expect you to waste your hard-fought winnings on alcohol.